This quick review was provided by Janelle, who is allergic to peanuts and tree nuts. We had a wonderful experience at the Crystal Palace for breakfast with my two year old. By far his favorite meal of the trip, we like to arrive early before the park opens and enjoy breakfast without feeling rushed. The chef arrived and took me straight to the buffet – Nearly everything was safe for my son. However, he was very clear to point out the items that were not and to tell me why. For instance, most of the baked goods were not and he made a point of telling me about the one that had almond flour – he was very clear and reassuring. He also told me if we needed anything special to let him know. 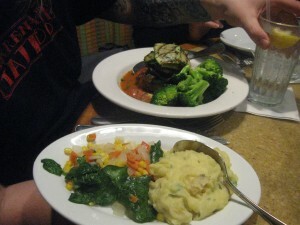 He spent a lot of time making himself available in the dining room and I was very impressed by the service and care. 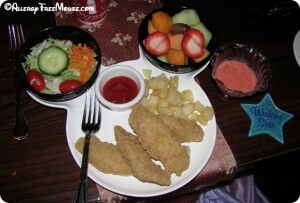 After eating at Chef Mickey’s the evening before, I had low expectations. 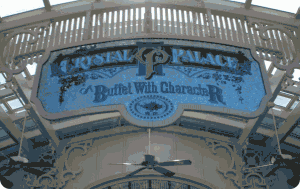 Crystal Palace will remain on our dining list for every Disney vacation. 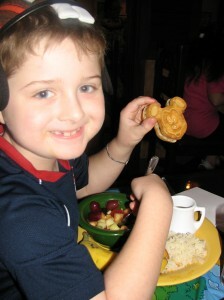 If you would like to review The Crystal Palace or any Disney restaurant, submit a food allergy dining Quick Review. This quick review was provided by Debi, who is allergic to gluten. 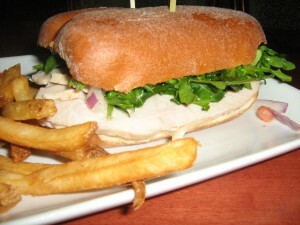 I ordered the Turkey Sandwich for lunch at Be Our Guest. It normally is served on a baguette, but for me, I believe it was a Udi’s HotDog Bun. It was very tasty. Since this was my first trip with food allergies, I was concerned. I ordered from the screen by touching the food allergies. From there you could select your allergy & they pulled up what is good for you. Sitting at our table with our magic rose, they brought my meal out separate than my dining companions. It had a flag in it marking it as allergy friendly. The taste was great, I could actually go for one right now. Worth checking out. 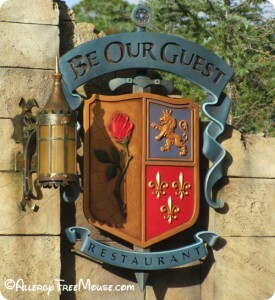 If you would like to review Be Our Guest or any Disney restaurant, submit a food allergy dining Quick Review. About 5 minutes after being seated, a chef arrived at our table to walk us through the appetizer buffet. He wouldn’t prepare anything for us in the kitchen, but just told us to avoid baked items like bread. I was not impressed. The chef came back to our table and said he could make baked chicken and potatoes with carrots, corn and fresh fruit. Even though it was ordered before the rest of our party’s entrees, DS’s allergy-free plate didn’t arrive until a full 10 minutes after everyone else had started eating. I’m glad we had brought our “just in case” stash of food for him to snack on while our 3yo waited impatiently for real food. His older sister was the reason we ate here (princess dinner), but the 3yo boy enjoyed it all, too. If you have a girl enamored with princesses, it might be worth it. But for boys….I’d pass and find somewhere else. 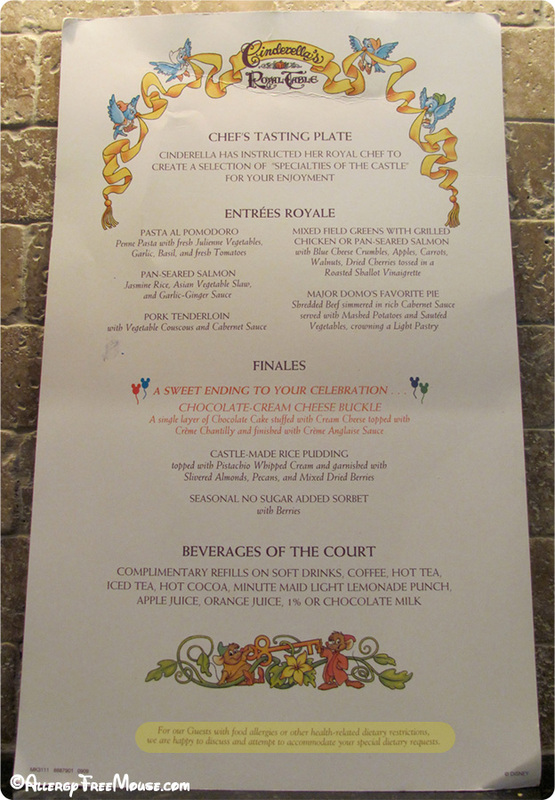 If you would like to review Akershus Royal Banquet Hall or any Disney restaurant, submit a food allergy dining Quick Review. This quick review was provided by Emily, whose son is allergic to Eggs, Dairy and Nuts. 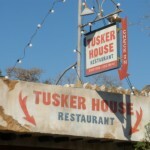 This is one of our family’s favorite restaurants. The chef came out and spoke to us. Checked to see if they had the allergy free nuggets and came back to let us know that they did. They made him fries and got him apple slices, too. The chef checked on us numerous times. The characters really help when you have food allergies. Often the food takes longer to make, so it was a nice distraction for our son. They offered desert but my son didn’t want any. He loves this restaurant and asks to come back all the time. 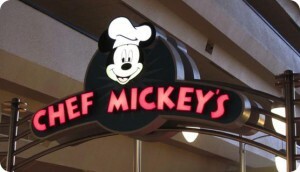 If you would like to review Chef Mickey’s or any Disney restaurant, submit a food allergy dining Quick Review. We are so excited to have Jane provide this guest review of her gluten-free dining experience. My family and I recently returned from an annual trip to Disney World. 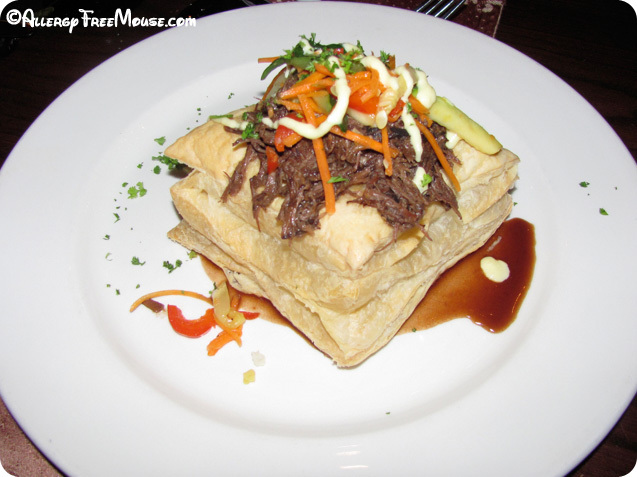 One of the most surprising dining experiences was at the Garden Grill in Epcot, the wonderful revolving restaurant. Reservations had been made, as our party has two people with Celiac disease, no wheat, gluten, barley or oats and one Vegetarian. We were greeted and escorted to our table quickly around 6:00 pm, restaurant was full. 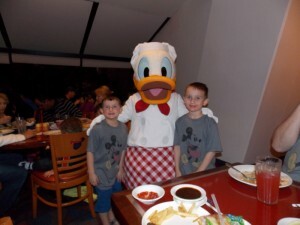 This is also a character dining experience, you get to meet Goofy, Pluto and Chip & Dale while you dine. 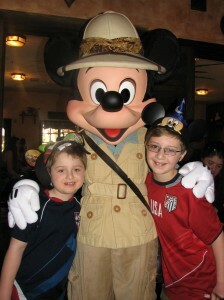 My grandson is getting a little old (almost 12) for pictures with characters, but he humored us adults. The waitress, a lovely woman from Brazil was very pleasant and helpful, when she saw the tickets with the allergies listed she immediately said the Chef would be right out. Chef arrived and talked over everything with us. Surprisingly all the food was Gluten free except the rolls, but gluten free rolls would be provided. 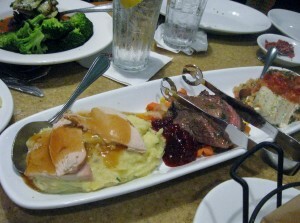 This restaurant is family style with servings of Roast Beef, Roast Turkey and Baked Fish. There is also a wonderful large salad served, which was brought with the bacon bits on the side.The vegetarian offering was really generous, my son received a very large plate of mixed vegetables with mashed potatoes and two smaller sides. The waitress informed him that the rice was cooked in chicken broth and for him to avoid it, she then brought the two smaller sides to fill in his selection for him. Everything was delicious, and served so nicely, not the usual platters and bowls full of food, but all arranged beautifully on a long platter. We did get a second platter and put a pretty good dent in it. The Turkey was served with mashed potatoes & gravy, the roast beef had a wine butter and the baked fish was served over rice, there was also a dish of green beans. Dessert was warm apple crisp and brownie sundaes for the those who could not eat oats. This was a very enjoyable dining experience and I would recommend it to anyone with any food allergy, they can accommodate you. Thank you, Jane, for submitting this review of The Garden Grill. If you found this helpful, please be sure to give her a thumbs up or share this on Facebook. I found this really cute pillowcase on Etsy. Originally offered in red, yellow and black thread, I asked CrossbonesandCastles to change the thread color to Cinderella pink and blue. It matches my daughter’s sheets perfectly! 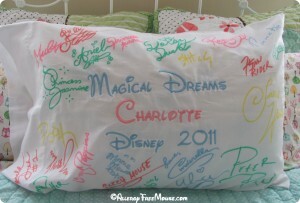 Not only does it look really cute, it was a lot of fun having the Disney characters sign it. We used a clipboard inside the case and four big paper clips to provide a solid surface to sign. It also kept the fabric markers from bleeding on to the back side of the pillow case. We chose matching colors for each character, where we could, and then positioned the case for each signature, then handed them the pin. Most of them loved it and looked at all of the other autographs. I love Eyore’s signature, and have a special place on the case for him to sign it on our next trip. Our daughter wants all of the Disney Fairies to sign the back. We’ve planned our next trip for October for the Mickey’s Not So Scary Halloween Party and we’re going to make a Halloween version for our living room. I’m thinking about a white zipped oblong sofa pillow to have all of the Disney villans sign! We’ll post it once we get back. 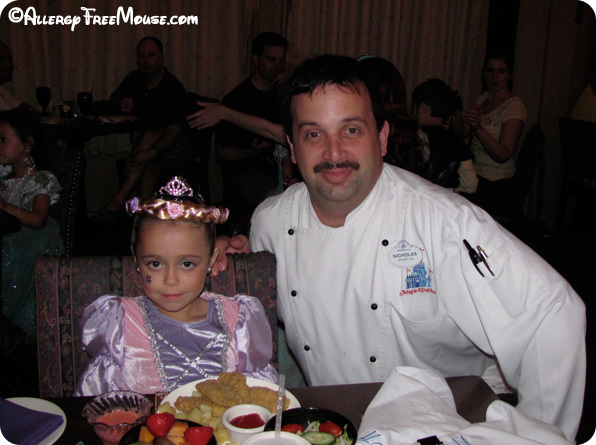 Dine in a fairytale castle atmosphere complete with a photo of you (or your child) with Cinderella. We’ve seen large parties (10-12) pose with Cinderella for a photo. The photo is included with your meal. During your meal, other Disney Princesses will visit your table for photos and autographs. Boys enjoy the fun with swords and your little princess will get a wand, of course! Everyone receives a “wishing star” to hold while the entire castle dining room wishes together. 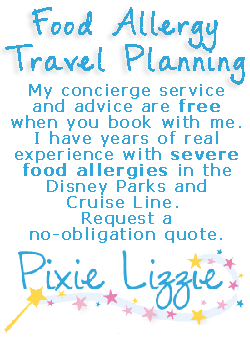 As always, remind the Cast Members of your food allergy as you check in. 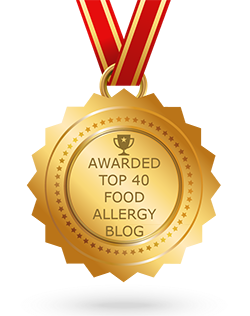 Remind you waiter and ask to see the chef — they usually offer when you mention a food allergy. They are extremely accommodating here and want you to truly enjoy yourself. I always view the menu online to find meal options to suggest to the chef, for our dairy allergy. However, I’m always pleasantly surprised to find that the chef has more options — often better than I had imagined. Be sure to make your advanced dining reservations as soon as possible, 180 days in advance, if possible. They really fill up quickly. I’ve phoned in at 7:00 AM to find a 30 minute hold time to make reservations 180 days ahead of time. Try to book online, if you can. Also, if you plan to visit the Bibbidi Bobbidi Boutique, make that reservation 2 hours before your reservation at Cinderella’s Royal Table. They tend to run very slow and you can always overlap your dining reservation. If this happens, inform the hostess at Cinderella’s Royal Table how long your Bibbidi Bobbidy Boutique appointment is running behind and they will usually make the necessary changes in your dining reservation. Along with the magic of Cinderella, her castle and the other Disney Princesses, we pre-order an allergy free cake to be delivered as dessert. This never fails to excite our daughter, since it’s rare that she has dessert if we’re dining out. After our meal, we ride a few more rides, then return to our hotel to store the cake in the refrigerator to be enjoyed all week! Our last visit was just as magical as our previous visits. Our daughter had the allergy free chicken tenders, a mixed garden salad with raspberry dressing, mixed fruit plate (strawberries, melon and cantaloupe), roasted home fried potatoes, and the custom-delivered chocolate cake. 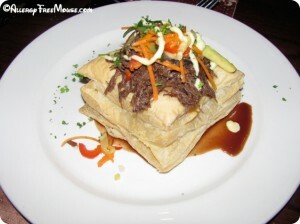 We both had Major Domo’s pie — shredded beef simmered in a rich cabernet sauce, served with mashed potatoes, veggies all on top a pillowed puff pastry. We also had an opportunity to order dessert, because our daughter was able to have dessert (the chocolate cake that we ordered)! We ordered the chocolate cream cheese buckle. It was creamy, subtly tart and all around delicious!. Chef Nicholas and the other Cast Members took excellent care of our daughter. We love you Chef Nicholas!